Want to see disruption happening in real time? Take a look at healthcare startups, these are the true rebels at work. These entrepreneurs will certainly re-invent Healthcare. There’s no doubt that startups are filled with disrupting, innovative agitators that want to deliver new radical ideas to the market. But what about the corporate rebels? Is it true that while startups are innovative by design, large companies are innovative by exception? Startups are indeed innovative by design, especially at their first stages, when everything is centered on one goal: survival. Procedures and bureaucracy are impediments for a company that is struggling to find a model that can be sustainable – generally, a business model that is repeatable and scalable. Corporations on the other hand, already have business models that work and they are not very keen on changing them. Corporate rebels face another completely different beast, they have to navigate through the organizational landscape communicating their ideas in such a credible way that they manage to push the company beyond the fears of uncertainty. We can interpret that fear as both the driving force and the deterrent, it just depends at which stage of growth a company is at. One very interesting approach to ideation and innovation is Lean Methodology. It has been used for a couple of years now and it may be on the brink of becoming mainstream, if it isn’t yet. It’s based on the principles of failing fast and continuous learning, which are inherent concepts of startups. Nevertheless, corporations could certainly benefit from using them as well. 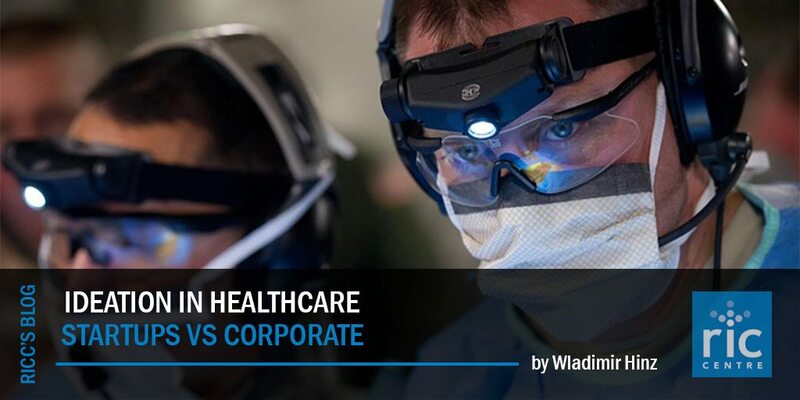 Ideation and innovation lie at the very core of the Healthcare industry. This is a huge moment for startups as they face an industry that requires enhanced quality care at very low costs – a perfect environment for disrupting technologies. Global demand for healthcare is increasing too; there’s a mounting number of older people in need of medical attention and numerous chronic diseases swelling up the system. This is better illustrated when looking at Venture funding deals, which have grown 200% from 2010 to 2014 in the U.S. Also, a quick gaze at U.S. Biotech Startups puts venture investment at $7.81 billion for the first half of 2015, which means that this year is almost sure to break all previous records in the Healthcare VC industry. The army of entrepreneurs that entered the industry in the last several years has never had more access to capital than right now. We may very well be in the midst of an epic decade. Mergers and acquisitions (M&As) are a nice indicator to see how alive an industry is, and right now the Healthcare sector is booming. This year alone has seen its (large) share of M&As, a trend that picked-off especially after the Affordable Care Act. So it shouldn’t be surprising to see the range – sector-wise – of these deals, from health systems to IT companies and software firms. Everybody seems to be fishing for the next blockbuster idea. The surge has been mostly motivated by the fact that early and mid-stage R&D – something traditionally done by big corporations – is now being done by small startups. This is happening because the costs of research have gone down significantly, not only for industry specific research like DNA sequencing or molecular modelling, but also costs relating to powerful computing and even product fabrication i.e. 3D printing for wearables. This proves very useful to startups, as they can now produce MVPs at more attractive rates, among other obvious advantages. With R&D getting replaced by startups, big corporations have seen the need to develop a new set of skills: shopping for startups. And as Healthcare costs are ultimately transferred to consumers, this raises the question, is this model more expensive? Buying startups might not be the cheapest way to innovate, but this is yet to be proven empirically. There are a large number of Startups worldwide, but it looks like every region has had a different approach to what their products are or will be. As sensors are getting cheaper to produce – and more accurate, Canadian Healthcare startups look like they have found a specific area attractive: Wearables and Platforms. MaRS has a very insightful analysis on this; everything looks to indicate that Canadian Startups are a force to be reckoned with. The Healthcare system is complex. There are numerous regulatory procedures that need to be followed and startups should consider them before starting any venture. Regulations in this sector are very strict and it may be complicated and time consuming to obtain access to the required data. This is very sensitive information not easily shared, and that nobody wants in the hands of hackers. Here’s a list of some of the things entrepreneurs might be forgetting to think about.